The Textbook of Iatrogenic Pathology represents a trans disciplinary collection of the main effects of drugs and medical interventions encountered in daily practice. 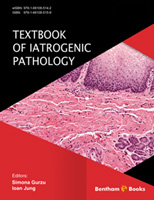 It is edited by two pathologists with significant experience in autopsy who are also teaching the under- and postgraduate students in field of iatrogenic pathology. The book is split in two parts. The first part that comprises 13 chapters was mainly synthesized by pathologists based on the literature data and practical aspects observed during daily autopsies. In the 6 chapters of the second part, the doctors involved in the clinical practice have presented the specific aspects of their surgical or medical specialties. This book is a necessity for all persons involved in the patient’s care, from student to Professor and represents at the moment the largest collection of aspects related to iatrogenic pathology. It is an original and complex book that include the newest aspect of iatrogenesis. It is always important to learn all our life not only from direct/positive evidences, but also from missing facts or/and medical errors. I strongly recommend publication of the Textbook of Iatrogenic Pathology as a necessity for awareness of medical staff in the field of consequences of the medical facts. The Textbook of Iatrogenic Pathology concerns doctors and medications. Iatrogenic is a word that derives from the Greek “iatros”, which means “doctor” or “medicine”, and “genic”, which means “induced by”. Thus, the book comprises a basic synthesis of the consequences of medical diagnostic or therapeutic procedures, as well as the main side effects of medications in daily use. In the present book, the authors aimed to present the interdisciplinary features of iatrogenic lesions. The book is based on the opinions of doctors from several disciplines, including pathology, surgery, intensive care, neurology, metabolic diseases, etc. In reviewing the existing literature, we did not find complex studies or large syntheses in this field, and therefore consider this book to be very useful to clinicians of all medical specialties. Moreover, the co-editor of the book founded the Department of Iatrogenic Pathology in our university and we offer, every year, lectures in this field for medical students (MD students, dental medicine students and nurses). Our practical experience (editor and co-editor) based on the lectures and everyday autopsies (we perform more than 200 autopsies per year), along with collaboration with clinicians, guarantees the complexity and originality of the present book. The book is organized into two main parts. The first (13 chapters) is written by pathologists and describes iatrogenic lesions (adverse drug reactions, lesions occurring during diagnosis and as consequences of therapeutic interventions) of the organs and systems. These chapters include practical examples from our daily practice in the Department of Pathology. The second part (six chapters) is written by clinicians and describes specific lesions induced by surgery, neurology, etc. The following main chapters will be included: adverse drug reactions; radiation-induced lesions (through radiotherapy); iatrogenic immunopathology (including pathology regarding organ and tissue transplantation); iatrogenic lesions of the cardiovascular system; iatrogenic lesions of the lung and airways; iatrogenic lesions of the digestive tract (mouth, pharynx, esophagus, stomach, small and large bowel); iatrogenic lesions of the peritoneum and abdominal cavity; iatrogenic lesions of the liver, bile ducts and pancreas; iatrogenic lesions of the kidney and urinary tract; iatrogenic lesions of the female genital organs and breast; iatrogenic lesions of the male genital organs; iatrogenic lesions of the bone marrow and lymphoid tissue; iatrogenic lesions of cutaneous tissue; iatrogenic lesions in endocrinology; iatrogenic lesions in neurology; iatrogenic lesions in anesthesiology and intensive care; iatrogenic lesions in general and thoracic surgery; iatrogenic lesions in gynecology and obstetrics; and iatrogenic lesions in neurosurgery. This book is for those who already have a basic understanding of the mysteries of the human body and have decided that they are ready to treat it. It is for young residents who believe that they already know all about medicine and its pitfalls. If you decide to read it, try to perform a self-assessment of your medical aptitudes. If you feel that the medical mistakes outlined here can easily occur, try to discover how they can be prevented. If you feel that they cannot happen to you, try to read more on the subject. Finally, do not forget that honesty is a doctor’s best policy and that the real physician is one who chooses to learn, to study, to be informed and to collaborate with his/her colleagues. To treat and help others, to be a doctor, can be a pleasure and can be a challenge, but it is also a daily choice. From time to time, a doctor cannot treat or help a given patient, and may make mistakes. This is a reality. To judge, to know, to think, to ask – these are the grounding secrets of a physician, and are mandatory to prevent mistakes becoming habits.